This is cool. Morag McDonald works in Tighnabruiach, a small village near my home town of Dunoon (she told me recently that some of my best friends from school were in Primary 2 when she started teaching there - a very small world when two bloggers unknown to each other have such ties). 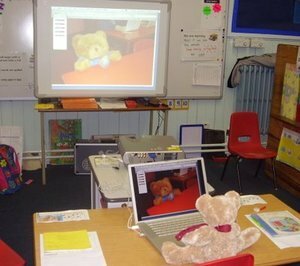 To get her wee boys and girls blogging she has enlisted the help of some colleagues elsewhere in the region, a blog and a pair of teddy bears, here seen videoconferencing for the planning stages of their collaborative blog. Pupils in the primary schools involved will write for the teddies (well, those paws do get in the way) to tell the teddies' parents in the other primary school what they've been up to. Is this collaborative Talking Teddies blog not a cool very sweet way to get young kids blogging? Do go on and leave some messages for the kids. The teds have the power! We have had so many more hits on our blog since you posted this...Thank you! I got into this in the interests of preparing our children for the future. An Alan November convert, I believe we cannot prepare them, without the experiences. In all of this there is risk, though. I have had postings from people identifying themselves by numbers and I cannot allow the children to think that a number should be responded to, but that will be a lesson in itself. It was very exciting to see mention of our blogs on your site. We hope to develop the topic further and are now discussing podcasting. Perhaps you could give us advice on the process? Children singing teddy bear songs, reading from bear books or talking on the bears' behalf about their adventures is the sort of thing we had in mind. I'll find out who is coming from Argyll & Bute to the Communicate.06 Conference and see if they can help you directly. Otherwise, keep your eyes peeled on this blog and on the MFLE: http://www.ltscotland.org.uk/mfle to learn how. Can't wait for podcast teddies. I've just had a wee peek at the Talking Teds blog - I think it's great! So child friendly! I'm looking forward to talking to our children tomorrow about this blog. They will be desperate to get in touch - I can see this sort of thing catching on...! Hi: I am a museum educator and the proud aunt of two wonderful neices. The 4 year old loves her teddy bears. I think that using the teds as you folks call them is a good way to introduce children to the world of computers at an early age. Go Teds! Jane Steele.